Carianne Campbell remembers the exact moment she fell in love with the Sonoran Desert. As a botany major in college, she joined a class field trip to Organ Pipe Cactus National Monument on the southern border of Arizona, arriving and setting up camp in the dark. Emerging from her tent the next morning, Campbell, who grew up on the East Coast, caught her first glimpse of enormous saguaros, clustered organ pipes and bright desert wildflowers. She knew immediately that she wanted to work in this kind of landscape. Carianne Campbell, Sky Island Alliance restoration director, releases a federally protected Chiricahua leopard frog into a pond. The frog was salvaged from a drying tank. Today, Campbell is the restoration director for Sky Island Alliance, a nonprofit conservation organization based in Tucson, Arizona. She leads efforts to re-establish native plant communities in “sky islands” — isolated, ecologically rich mountain ranges that dot southeastern Arizona and New Mexico and northern Sonora, Mexico, and serve as home to some 7,000 species of plants and animals. Under Campbell’s guidance, Sky Island Alliance restores riparian habitat that’s been overrun by invasive species, such as fountaingrass, which crowds out local species and transforms the desert into fire-prone grassland. The point of Campbell’s job used to be relatively straightforward: She attempted to conserve local biodiversity by re-establishing the wild spaces where native plant and animal species once lived. But given the planet’s rapid climate shifts, the connections between wild organisms and their ecosystems are fraying, forcing restoration biologists, including Campbell, to rethink the purpose of their work. It no longer helps to remember what a site looked like 20 years ago. “We need to be thinking about what it’s going to be like 20 years into the future,” she said. In the early 1980s, ecological restoration was much like cleaning up after a rowdy house party: trying to return a degraded habitat to its former pristine condition. Project managers focused on returning the right numbers and species of plants — and by extension, animals — to places that had been logged, mined, invaded by nonnative species or otherwise altered by people. “I’ve always been taught that restoration is about taking a degraded site and restoring it back to what it was before the disturbance,” Campbell said. But increasingly, scientists who study ecosystems, as well as land managers who do restoration work, are questioning that model of ecological restoration, which relies on the idea of a stable “climax community,” even though many ecosystems are always changing. Sky Island Alliance volunteers plant native grasses in Tucson's Sabino Canyon during Beat Back Buffelgrass Month. The sun sets over a pond constructed by Sky Island Alliance at Camp Rucker, Arizona. A crew of Sky Island Alliance volunteers carries the last layer of geotextile to a newly constructed pond at the south end of the Galiuros Mountains in Arizona. Sky Island Alliance volunteers remove invasive vinca from Aravaipa Canyon. Sky Island Alliance volunteers assess the diversity of species in a spring in Graham, Arizona. Finding the current conditions allow them to determine how to best support the ecosystem. Some plants, like this seepwillow (Baccharis glutinosa) growing along Aravaipa Creek, are resource powerhouses for a variety of different pollinator species. The West’s forests, for one, are much more dynamic than many people realize. Notwithstanding individual tree outliers, such as millennia-old redwoods and bristlecone pines, most North American forest ecosystems are, at most, 400 or 500 years old, according to Don Falk, a forest ecologist at the University of Arizona. Reasons vary, from a severe drought in the late 1500s, to 1800s tree harvesting by Euro-Americans. Today, forests continue to undergo constant change. “Many of the forests we look at are in post-fire recovery, we just don’t see it,” Falk said. Outbreaks of insects such as bark beetles, which can decimate forests, add to the constant change. “We want to think of the primeval old-growth forest as having this stable characteristic, until we come along and introduce disturbance … but the idea of forests in equilibrium is probably wrong.” Indeed, events ranging from volcanic eruptions to the Pleistocene ice age have left their mark on the West’s forests. But with climate change, landscape-level transformations are happening faster and becoming more extreme. As the West becomes warmer and drier, the idea of “recovery” becomes increasingly unrealistic. Instead, ecosystems transform, such as in northern New Mexico, where Gambel oaks may replace pine forest after a fire. “This is really a vexing problem for the field of restoration ecology, because our first instinct — and it’s not wrong — is always to want to put it back to the way it was before we screwed things up,” Falk said. This identity crisis is global: This year, at conferences from Iceland to Washington state, the Society for Ecological Restoration is grappling with the question of restoration during climate change. Instead of trying to re-establish a checklist of plants and animals, as they might have in the past, some restoration practitioners are now focusing on ecosystem functions. For Campbell, that means worrying about pollinators, including birds, bats and insects, in the sky islands. Across the West, spring is thawing earlier and broiling into summer faster, and the region is getting hotter and drier overall, creating a mismatch between periods when pollinators need flowers and the times and places where those flowers are available. “How can I use various plant species in ways to ease that?” Campbell said. Campbell keeps climate change and pollinators in mind when she’s selecting native vegetation to plant. A low-elevation site might have red, tubular flowers in the spring, for example, and then again in September, but none during the hottest summer months. “I could plug in a species like desert honeysuckle, which would be blooming in that interim time, and providing a more constant source of nectar,” she said. Research on the timing of flowers and pollinator arrivals supports Campbell’s concerns, although scientists don't yet know the consequences of these mismatches. Nicole Rafferty, a University of California, Riverside ecologist, studied the flowering schedule of manzanita, a mountain shrub with wine-red stems and glossy leaves, in the sky islands. The timing of the winter rains determines the appearance of manzanita blossoms, which are among the first mountain flowers each spring. But with winter rains arriving later, manzanitas are not flowering in time to feed the earliest native bees. Those later-flowering manzanitas also end up growing less fruit, which mule deer, black bears and other animals eat. Most plants have a wide enough variety of pollinators so that they won’t disappear entirely, Rafferty said, but the fate of those pollinators is harder to predict. She’s had to adapt how she uses native species, because of the changing rainfall patterns. For many years, Sky Island Alliance planted native vegetation in the spring, following the winter rains. But two years ago, Campbell noticed that most of the plants died. With spring arriving earlier and becoming hotter, “there’s not enough time for those new plants to become established, and then be able to go dormant to make it through to monsoon season, and become good members of their vegetation society,” Campbell said. She has stopped spring planting altogether at restoration sites, waiting instead until after the summer monsoon rains. 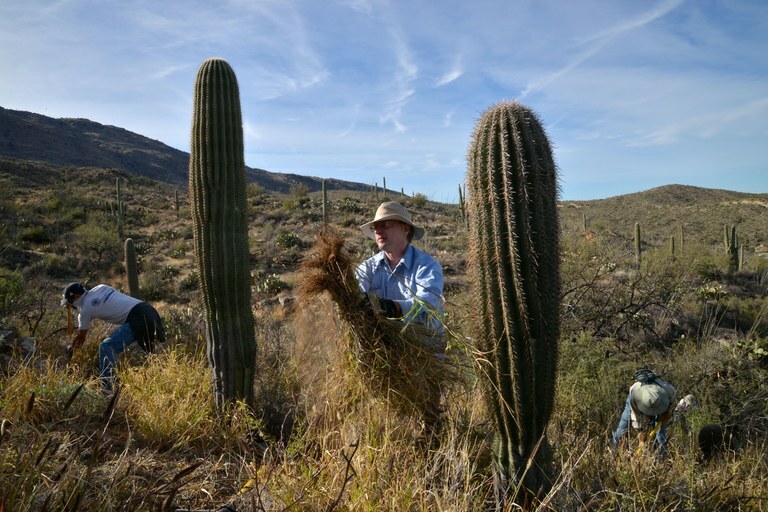 Volunteers remove buffelgrass, a nonnative invasive species, from Saguaro National Park East. The new focus of ecological restoration is “less about identifying the particular species, and more about the traits,” Elise Gornish, a cooperative extension specialist at the University of Arizona, said. Gornish surveyed almost 200 California managers, including master gardeners, ranchers, nonprofits, federal employees and others, about nonnative species. Close to half of her respondents, including most of the federal employees she interviewed, already used nonnative plants in restoration projects, often for erosion control. One reason was that they were less expensive. But almost 40 percent of the managers also contemplated using nonnatives because of climate change. “It’s clear that folks are really, really concerned about climate change and restoration,” she said. “A lot of folks wouldn’t use the term ‘climate change’ to describe their challenges; they would say things like ‘drought,’ ‘changing environmental conditions.’ ” But the bottom line is the same: “Practices people have been using historically, and probably pretty successfully, and things that are now policies among the federal agencies … are not successful anymore,” she said. Some plant populations, for example, are responding to climate change by moving up in elevation and in latitude. “What this suggests is that if you’re in your site that needs restoration, the plants from that area are probably no longer well-adapted to the new conditions of that area,” Gornish said. This raises prickly questions about whether or not to start using plants from farther south and lower elevations, or even from entirely different regions. “People get extremely nervous, and with good reason, when you start talking about moving plants around,” Gornish said. The U.S. has not had a good track record with introduced species. “Some of our most noxious invasives, like tamarisk or buffelgrass, are things we planted 80 years ago,” she said. Not that long ago, the inclusion of nonnative plants species in restoration projects “was heretical,” Falk agreed. Now, however, those species may be the best-adapted flora for a region’s changing climate. But for Falk, managing for functions more than for species is still ecological restoration. It’s always been true that, ultimately, “you’re trying to maintain the ability of a system to adapt,” he said.